Are You Ready For Whatever This Summer May Bring? 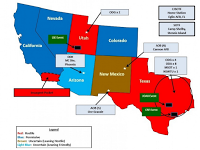 —will be taking part in Jade Helm 15 exercises. Will those states be ‘under siege’? In late April, there was a town-hall-like meeting held in Bastrop, Texas, where citizens expressed their concerns about Jade Helm 15. Here’s The Washington Post’s report on that meeting.